So, it's downright chilly outside...and we're experiencing a "nor'easter" which I had NEVER heard of until I moved here. For those of you that don't know what it is either, you can find out more HERE. Anyway, there is almost no better way to spend time when you're stuck indoors than knitting (my dogs would disagree...they still believe there is NOTHING good about inside except TREATS). But I digress. This post is about all the knitted good I'm making...But you really can't SEE in the photo above. It's another hat, similar to THIS ONE. It's for another friend having a birthday this week. I have to keep it sorta quiet, tho, cuz she'll find out before she gets it! Anyway, here's a little care tag I made for her hat. And it fits, given our present weather conditions! I had so much fun creating this tag...It was a REAL mess, tho, cuz I painted and glittered, and painted some more, and glued...and YIKES...I let the paint DRY on my stamps, so that was a different challenge. Anyway, the snowflake stamps that are Unity (SNOWFLAKE KISSES), and that photo frame...also Unity - from CAPTURED LIFE. And I used two different Crinkle Ribbons from 3GIRLJAM - Spooky Bundle and Celebrations Bundle. My favorite part, is what I wrote for the care instructions. I dunno, it's probably not right to say, but I just LOVED it. What do you think? Agree? I thought it was such fun. The hat -- ALIVE. It sounded to as if the little hat was actually knowingly involved in the process of keeping my friend warm! It'll be a mystery, but I'll let you give some input on what you'd like included....do you like rubber? How about designer paper? Card stock? Accessories? Paint? Art supplies? You name it in the comments, and I'll put a great supply of goods together. And instead of just one winner...doesn't two sound better? Thought so! I'll announce the winners next Friday! A lovely tag! Can't wait to see the knitted gift. I'm sure the tag looks great with it. Love your care instructions - so cute! i absolutely LOVE your tag! that's so pretty! Beautiful tags! And you should love your creations, they are fantastic! 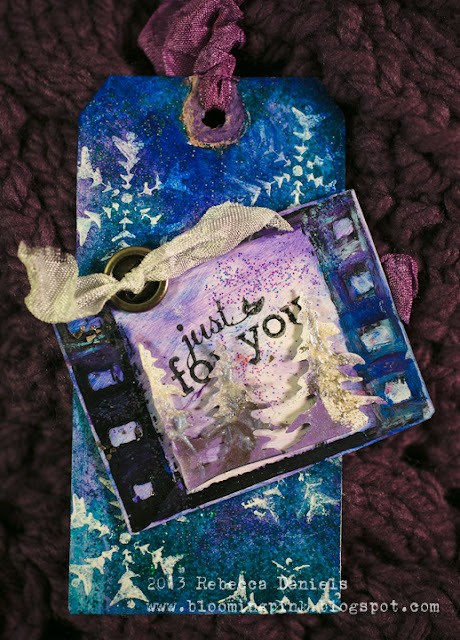 Gorgeous tags...love all the texture! TFS! Gorrrgeous and can`t wait to see more!! Your tags are gorgeous!! A great addition to the knitted hat!! Cardstock, ribbon anything crafty is great. holy moly I LOVE that first tag! Wonderful tag and I really like the care instructions! Congrats on your >100 followers. I am a card maker so I like rubber, paper, cardstock etc. Ohhh how cute!!! I love that little saying for how to take care of the hat! Fabulous! Two awesome tags! I learned to crochet a bit as a young girl, but I just could not get knitting. As for the the inside doggie here, I have visions of her turning into one big treat. Rubber or paper, I hoard them both! Rebecca!!! This tag is AMAZING. Textures, colors... ahhh... beautiful. I'm just so impressed. How fun to have so many hobbies, your friend is going to love both. And blog candy... well I love it all so I will be back to check on you and congratulations on your 100th follower! 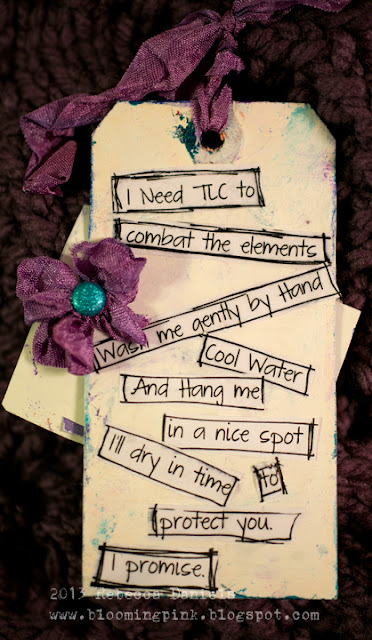 I love the tag and the message is fabulous! What a beautiful tag with a cute twist! Both tag designs are fabulous!!!! Love all the texture, elements, and sentiment. Beautiful tag, Rebecca! Congrats on your >100 blog followers.